A System designed to deliver hot water 24 hours a day, without using electricity. This system is based on reliable, new and more efficient Evacuated Glass Tube (patented) technology by virtue of which the temperature of water can be raised upto 95°C (environmental & usage dependent). This has a clear advantage over conventional Flat Plate Collectors technology. Minimal installation is required for the system. 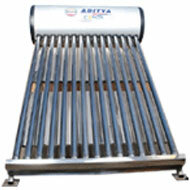 The systems have provision for heater, which can be used in case of consecutive non sunny day. Use of a 110 LPD system saves upto 1500 units of electricity in a year. The system reimburses its cost in 2-3 years, subsequently offers a bonus to the customer by saving in electricity and gas bills for the rest of its service life (expected 15 years). Consol super conducting vacuum tube is of very low thermal capacity, and extra ordinarily prompt thermal conductivity (1000 times of that of copper), so it's a very efficient heat transfer vacuum tube. And It's of the function of unilateral diode, for example: the transfer of heat power is a direct process- heat is transferred from vacuum tube to the water, but heat could not be reverted back to vacuum tube. The highest working temperature of the system could be controlled to ensure the stability of the system, because of the physical effect of working medium and special configuration of condenser. Consol vacuum tube is of prominent ability to absorb the solar power. It's high degree of vacuum could decrease the heat waste, its selective coating could transfer both the direct radiant energy and diffuse radiant energy of sunlight to the super conducting vacuum tube. The vacuum tube is responsible for absorbing the solar power efficiently and insulating the thermal energy, and it could stop the thermal waste in bad weather conditions, the heat pipe is responsible for transferring the solar power to thermal power. The optimization combination of these two parts could exceed any other solar collector greatly even in unusual conditions. That's the magic of Consol Vacuum tube+Consol heat Pipe. The coated layer on the vacuum tubes, absorbs the radiation of sunlight. This layer then transfers the radiation to heat the water. The reflecting sheet facilitates this process. By this process water is heated up in the tube, while the water in the tank is cold. Hot water being lighter rises up to the tank and cold water from the tank comes down to the vacuum tube to start a circulation by thermo-siphon. Gradually all water in the tank becomes hot and ready for use. The tank shown is adequately insulated using Polyurethane insulation, which prevents the water from losing its heat content not in excess of 5% during night-time. Also available in other capacities on order. Requirment : Small roof space and aspiration for better living. Aditya Solar in the business of marketing solar hot water solutions since the year 2000 & have facilities to supply, install and service any size of solar water heater across India. 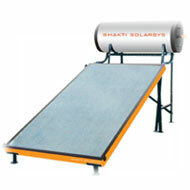 Solar water heating systems are manufactured under stringent quality standards to produce a high quality product. With Solar and backup heaters, you may expect guaranteed performance 365 days of the year. Safety feature against galvanic action through the provision of sacrificial anode, to protect the tank from corrosion due to the galvanic action from the dissolved salts. Our Solar collectors have a superior coating of black chrome “Nalsun” coating on the copper absorber plate, done by using latest state of the art technology. It not only exhibits high stability to UV radiation but also offer greater absorption and also protects the copper fin from degeneration over a period of time, thereby enhancing the life of the collector (20 years – if used properly). Our Solar collectors have been certified to be among the best in the Indian market, with the highest efficiency of 79%(consistent over a wide range of input and output temperatures), which is tested by Regional Test Laboratory, Madurai Kamaraj University, under MNRE, Govt. Of. India. The shearing and cutting of the dish ends is done on imported machinery from Germany, in an ISO 9001:2000 factory, under stringent quality checks and systems. Our Solar Tanks are made of 10 SWG to 16 SWG sheet of stainless Steel - 304 grade and seams are TIG welded and ends are reinforced to avoid pressure bulges. This is Unique since most of the competitors use SS 434 and do ARC welding. The disadvantage of ARC welding is that it will not be a stainless steel weld but mild steel joint on stainless steel. Thus, it can get corroded over a period of time. Our Solar tanks are pressured tested (5 - 6 kg/cm2) before dispatch to the site as this will ensure leak proof tank and any weak joints can be rectified to give you a the best system quality. We use rockwool pads for insulation of the tanks (100mm), solar collector and system pipeline. This has a density of 48 kg/m3 with thermal conductivity of 0.029 W/degrees.K. This is amongst the best materials available. We use stainless steel hardware on solar panels boxes. Our boxes are aesthetically painted to give good show and appearance. The Riser and the Fins are joined through Ultrasonic welding, much different from the laser welding which is performed by a few of the competitors. The materials are manufactured as per the specification mentioned. No compromise in the quality.